Join us as we take a trip down memory lane and look back at the arcade classic that is ‘Contra’. Man, this game brings back memories of long sessions at the arcade. It was one of those games that enthralled, as the non-stop action was all you needed as a child to keep you entertained for hours. The game was very basic in its mechanics, graphics, and gameplay, but it was highly addictive. The cool thing was that you could play with a mate and the experience did not suffer. If anything, the two-player option added an extra dimension of chaos to the action on screen. Bill and Lance were the playable characters. They both had muscles for days and sweet bandanas around their heads. They were the guys we wanted to grow up to be, minus the violence. Read that back slowly and imagine you are ten years old again. How sweet is that?! What was frustrating though was the very strict movements each character could make, but you got used to it over time. I suppose for the time the game was revolutionary in the mechanics side of things, as fluidity was not yet known to the game world. Still, thinking back to only being able to shoot in eight directions is quite a laugh. Doing the research for this has actually sent me down the path of nostalgia. We are very lucky to have games like this where we can look back and get a major blast from the past. While today we are so consumed by every little detail in video games we tend to forget that often less is more. 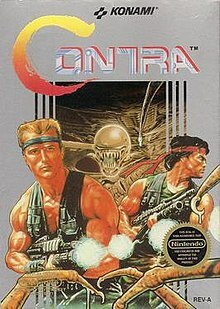 Games like ‘Contra’ allow us to appreciate that fact.